A GENERATION-spanning exhibition of indigenous artwork from around the Lower Clarence will go on show from today in Maclean's CWA building. The Yaegl Country Aboriginal Art Exhibition - now in its second year - will bring together pieces of art, jewellery and other artefacts from lower river Aboriginal artists from as young as 10 to as old as 50 and beyond. 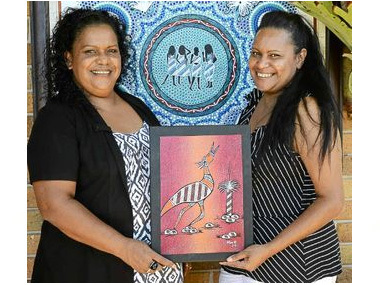 Newcastle-based, Aboriginal artist Elsie Randall grew up in the Lower Clarence area and is one of the artists who will have works on show in the exhibition - she said given the great response to the exhibition last year, it made sense to run it again. "Last year was a success - the community did some beautiful work and they sold a few pieces and felt that sense of accomplishment and reward and they wanted to do it again," Ms Randall said. She said not only was the exhibition a great way to show the talented pool of local Aboriginal artists, it also brought the whole community together with Clarence Valley Council, local businesses and Aboriginal and non-Aboriginal agencies all getting behind the event. "It's just been wonderful - we're hoping to do this every year now because it's an event where we see the entire community pull together as one," she said. The exhibition opens at the CWA Building in River St Maclean from 9am today with an official launch to be held from 5pm tonight. Entry to the exhibition is via gold coin donation.